Mahugh Fire and Safety is a DOT Certified testing facility. Hydrostatic testing is the standardized method of testing cylinders that contain compressed air or gas (ex. SCBA or SCUBA Tanks). We test cylinders using the water jacket method of testing cylinders that contain compressed air or gas. 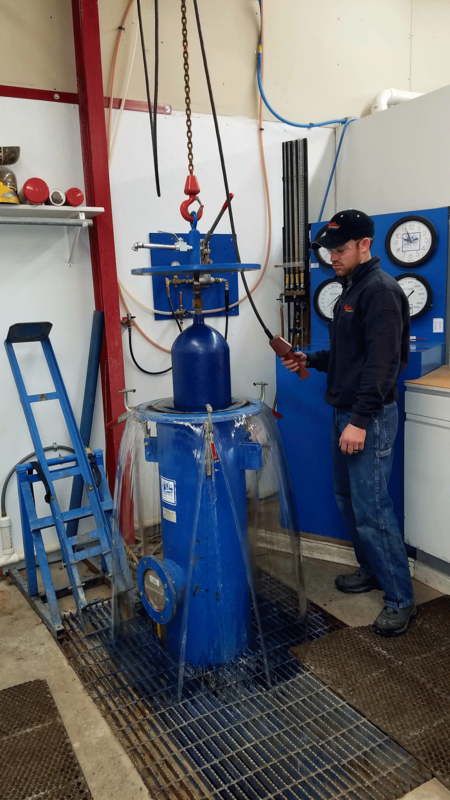 This method of testing cylinders essentially consists of enclosing the cylinder (filled with water), suspended in a jacket vessel and pressurizing the cylinder to a specific test pressure. This measures pressure loss (leaks) or any permanent deformation (strength) of the cylinder. What happens if the cylinder passes inspection? The cylinder will be stamped and labeled indicating the month and year tested. What happens if the cylinder fails inspection? The cylinder is required to be disposed of and will not be returned to service.